NORTHUMBRIA Juniors took on the cream of North East squash at Pontefract last weekend – and a Fantastic Four of Jamie Todd, Charlotte Cooper, Michael Mattimore and Dan Neill rose to the very top. Jamie Todd – Boys U17 winner at the NE Regional Championships – takes the honours as Mister Fantastic, who, according to Wikepedia “can stretch his body into incredible lengths and shapes”. Alnwick’s Chris Wiggins, beaten finalist in the same tournament, can testify to that, as the Toddmeister came through a 3-0 winner (14-12, 11-1, 11-8) after both had seen off the fast improving Stuart Macgregor of Yorkshire in the final round-robin group. 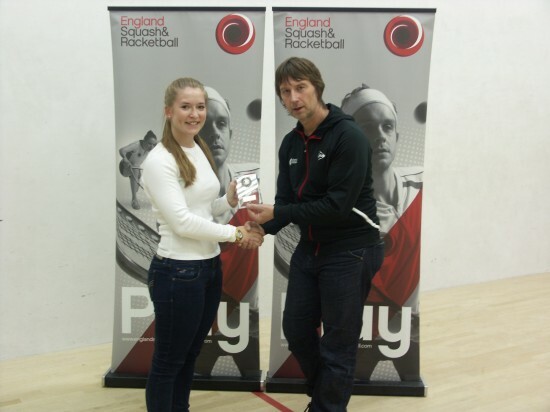 Again at U17s, girls glory went to Northumberland Club’s Charlotte Cooper – aka The Invisible Woman (just bear with me here, OK). While not technically invisible on court, I agree, Marvel Comic nerds will attest to this superhero’s ability to “project powerful force fields”; and so it came to pass, with Charlotte Fish and Megan Kaye of Yorkshire, and Northern’s Tegan Younger all falling victim to Coops’ victory march. There is no holding back The Human Torch (Michael Mattimore) either. The Northern starlet saw off Nick Walls and came through a real humdinger of a boys U15 final – clinching it 11-9 in the fifth against Norton’s in-form Oliver Walls. Not sure if Michael strictly fits the Wiki definition – “can generate flames, surround himself with them and fly” but he certainly shows a fiery determination on court so we will settle for that. 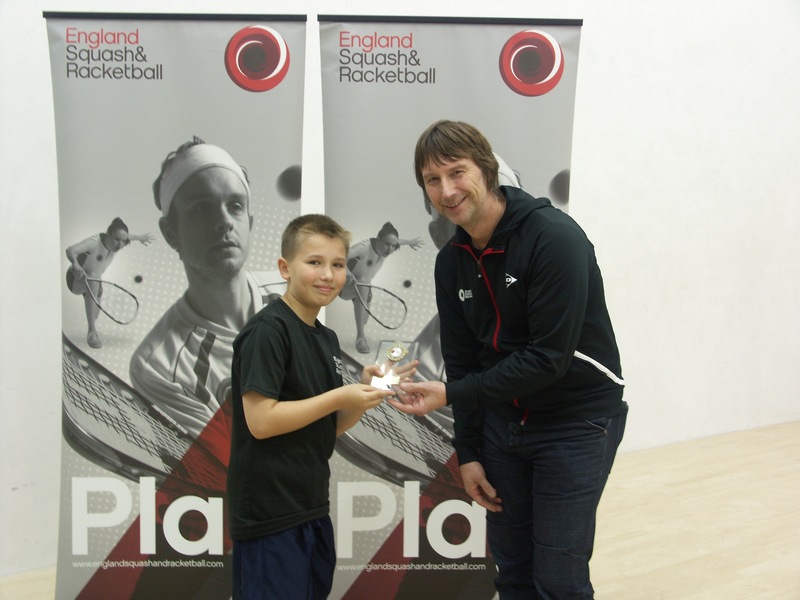 Now to The Thing – step forward Boys U11 winner Dan Neill. Will have to check with his mum about his “grumpy yet benevolent nature” – but when you remember The Thing’s “superhuman strength and endurance”, the moniker is well deserved. 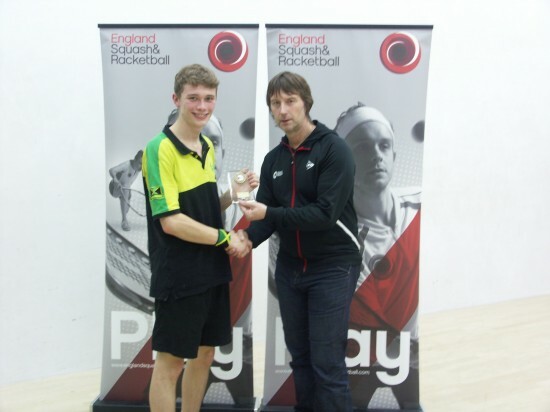 Dan crushed the field at Pontefract, seeing off Durham’s AbdAllah Eissa 2-0 in the final (11-4, 11-7) to take the trophy. Other notable performances including Dan’s big sis Laura Neill (runner-up to Yorkshire’s Ellen Cooper at Girls U15s, Josie Barker (3rd in the same event), Erin Vitty (4th at Girls U13s), Max Forster (4th in Boys U13s) and Cai Younger (4th in Boys U19s). Taking four of the nine trophies up for grabs is a superb effort from the Northumbria mutants who were, after all, battling against the best Yorkshire players on their home turf. 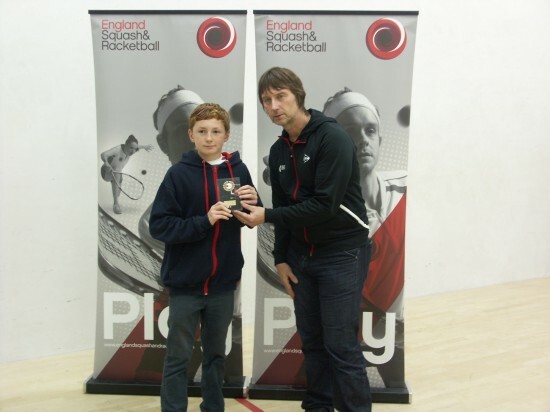 MR FANTASTIC: Boys U17 top dog Jamie Todd with Mark Shipley from England Squash. NOW YOU SEE HER: Charlotte Cooper (Miss Invisible) gets her trophy from Mark Shipley. ON FIRE: The Human Torch Michael Mattimore is pleased to get his trophy (well, a little bit). SMILES BETTER: Dan ‘The Thing’ Neill gets his Boys U11 award from Mark Shipley. I think the human torch was playing it cool whilst collecting his trophy!